Black sea turtles are unique members of the sea turtle world. 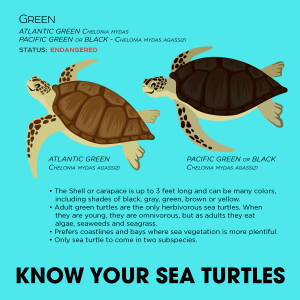 While currently classified as the same species as the green sea turtle, the pacific black sea turtle has several features that make it one of a kind! The black sea turtle can be found in the eastern tropical Pacific and are not commonly observed in the open ocean. Adult black sea turtles tend to inhabit bays and protected shorelines from Baja, California all the way down to Chile! 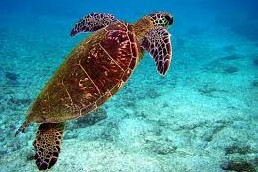 Officially known as the East Pacific green sea turtle, the black sea turtle is smaller and darker in color than the green sea turtle. Black sea turtles also have a teardrop shaped carapace, making its shape different than the oval shaped green sea turtle. Black sea turtles’ heads are even smaller than the heads of green sea turtles! Black sea turtles tend to be smaller than green turtles, but can still weigh up to 300 pounds and reach 4 feet in length! Also, black sea turtles are the only sea turtle known to nest in the Galapagos Islands – most of their nesting occurs in Central America, Mexico and the Galapagos. Black sea turtles also even be found basking in the sun along the Hawaiian Islands, which is a characteristic not commonly found in other sea turtle species. 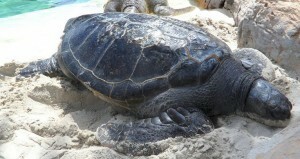 The black turtle has a similar diet to that of the green sea turtle. As grazers, both types of sea turtle eat algae, sea grasses and mangrove shoots. Additionally, they will both occasionally eat small fish, jellyfish and other invertebrates. Current DNA research indicates a close genetic relationship between the two types of sea turtle. Based on this evidence, they are classified as the same species. However, due to their differences, some experts consider the black sea turtle to be a sub-species of the green sea turtle, while other experts consider the black sea turtle to be its own species – so this question has yet to be answered. Historically, colonies of black sea turtles thrived in Mexico and Central America. The fishing industry and illegal harvest of eggs and sea turtles for meat has decimated these populations. Today, they are still caught illegally for food and accidentally in many types of fishing nets. Many conservationists consider a separate species designation as important to saving the black sea turtle, as it would certainly gain additional protection status – since the black sea turtle is more threatened than the green sea turtle.